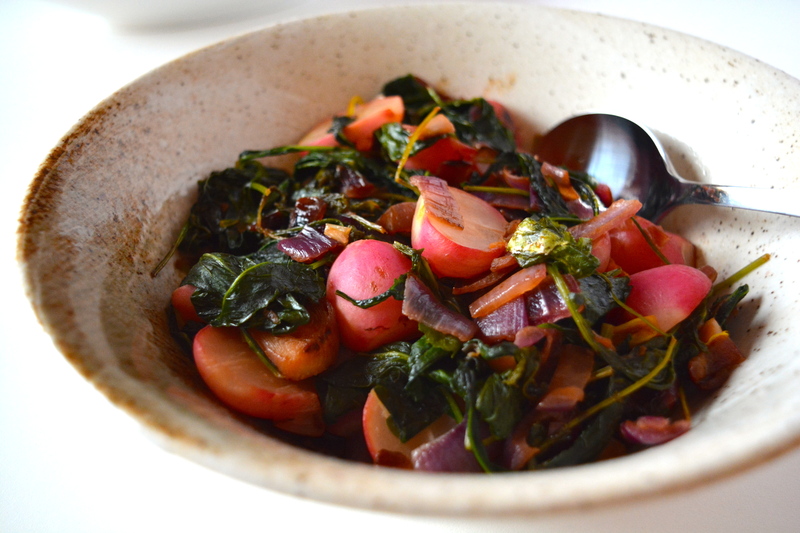 Any greens and alliums can be used in this one-skillet dish, apple cider can be swapped for the citrus. Try dandelion greens with toasted garlic, then nix the sugar and simmer in cider instead. Mix the citrus juice with the sugar, stirring until the sugar has dissolved. Put the olive oil in a skillet over medium heat. Add the onion and cook, about 5 minutes, until tender. Add the radishes and cook for 5 minutes. Stir in the kale and add the juice, cover, and let steam for about 2 minutes, until the kale has started to wilt and the mixture is easy to stir. Turn the heat to medium-high and cook until the juice has absorbed, about 2 minutes, stirring often. Season with salt and pepper to taste. Serve warm. Creamy, sweet, and crispy, these patties use chickpea flour to help bind them, giving a falafel-like flavor with a hint of sesame and lemon. They’re super easy to put together (especially if you have leftover sweet potatoes), and easy to adapt–try different greens, use olive oil instead of sesame oil, and add any fresh herbs you love. Leftovers are perfect for packed lunches, too! Heat the oil over medium high heat in a skillet. Add the kale and green onions and cook until the kale is wilted, about 2 minutes. Put the mixture in a bowl with the sweet potatoes, chickpea flour, ground flaxseeds, cilantro, sesame oil, ginger, and salt and pepper. Mix well, adjusting seasoning to taste. Use sesame-oiled hands to roll pingpong-sized balls of the mixture between your palms. Repeat with remaining mixture. Bake for 15 minutes. Turn, and bake for 10 minutes more. Remove the balls from the oven. Use your palm to gently flatten into a patty. Bake for 5 minutes more per side, until golden on the edges. Sprinkle with zest. Drizzle with sesame oil and lemon juice. Serve warm or at room temperature.